The tour offers a complete overview of the island. Our goal is to satisfy the needs of the riders who want to explore the hinterland, but we also aim to stimulate the curiosity of those who choose the island because of its amazing sea, intriguing and encouraging them to move away from the crowded beaches to discover an unknown inland. The landscape charaterized by a nature once sweet and later bitter, but always wild and fascinating, is an ideal theatre for this kind of experience. Plenty of monuments and archaeological sites will be encountered along the way (nuraghi, domus de jana, graves of giants ...), they represent the ancestral forms of a human settlement process. The local population reflects the authenticity of this unaffected environment. All this will be a real "exclusive" experience, a "unicum" not found in the usual tourist routes. Start and arrival: Olbia - Olbia. Duration: 8 days - 7 nights x 20 people. 1st day - Saturday - Arrival in Olbia. You can arrive by boat or plane, we will take you to the Residence Cala Paradiso, in Capo Coda Cavallo, where all participants will know each other. At the Residence, overlooking the sea and the islands of Molara and Tavolara, it will be conducted the briefing on the weekly program. 2nd day - Sunday - Stage 1 - Departure from Capo Coda Cavallo and arrival in Oliena (Su Gologone) - Km 210. We will cross the granite massifs of Padru and Alà dei Sardi and visit the nuraghe Loelle of Buddusò. A beautiful mountain road on the slopes of mount Montalo it will offer fantastic scenery with sea views. 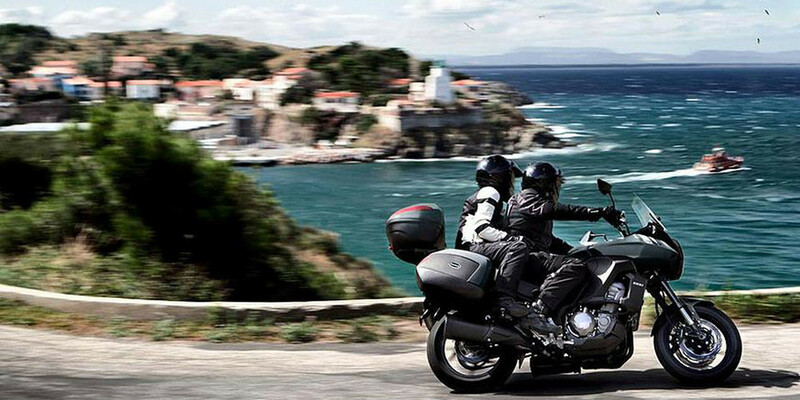 We will visit the medieval village of Posada and travel along a stretch of the legendary SS 125, reaching Su Gologone. 3rd day - Monday - Stage 2 - Departure from Oliena, arrival in Arbatax - Km 220. Departure from Oliena towards Orgosolo, inland town which attracts thousands of tourists for its murals. In Montes we will admire the stunning views of the Supramonte and Gennargentu, we will cross the Barbaricini mountains with picturesque landscapes where the eagle nests. 5th day - Wednesday - Stage 3 - Departure from Arbatax, arrival in Barumini - about 200 Km. During this stage we will cross the Ogliastra's hinterland viewing several lakes and limestone cliffs. We will spend the afternoon in the Gesturi jar, where there are the only wild horses in Europe. We'll get to Barumini where there is the largest known nuragic castle . 6th day - Thursday - Stage 4 - Departure from Barumini and arrival in Piscinas - Km 300. In this stage we will visit the Sardinian capital, Cagliari, the ancient Roman ruins of Nora and Bithya that overlooks the Gulf of Cagliari. We will pass to Spartivento Cape and Teulada Cape, extreme southern peaks of the island. Heading back north towards Piscinas we will cross the mining areas of Nebidda, Masua and Buggerru. The arrival in Piscinas will be shocking for the beauty of the "Piscinas Dunes", the only "desert" of Europe, that exceeds a height of 50 meters. 7th day - Friday - Stage 5 - Departure from Piscinas, arrival at Alghero - about 300 Km. We will visit various places with plenty of archaeological sites and natural beauty, such as the beaches of white quartz in Mariermi and Is Aruttas. In the afternoon, in the stretch between Bosa and Alghero, with a little luck, we can observe the griffon vulture in flight. 8th day - Saturday - Stage 6 - Departure from Alghero and arrival in Olbia - about 210 Km. We will visit the Temple Mount D'Accodi (only ziguratt in Sardinia and one of the oldest archaeological monuments of Europe). Visit to Castelsardo, an ancient medieval town, in Santa Teresa di Gallura, far north of the island, and pass through Costa Smeralda, before the arrival in Olbia.